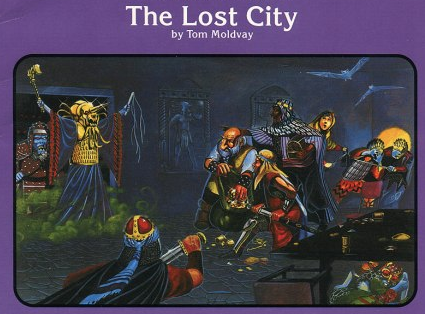 My players said in our run through of module B4 The Lost City “this is like call of cthulu”/”this adds a nice little something”/”I may be delusional but do you hear this [masked] guy speaking or am I just hearing things … ya I hear him speaking but I’m delusional as well so who knows”. These cards give the OKAY to play … because having FEAR justifies them saying that they won’t go first in marching order and everyone accepts it. One delusional character rolled around in glowing beetle guts to become a human torch. I’m not sure that would’ve happened without the cards. The funny thing is, while I talk a lot about classic D&D and about horror games, the thought to actually intermix the two never really struck me. Ryan made a great choice in using them in module B4, which is full of weird and creepy stuff already. I’m really fascinated by the idea of using them with a light touch like this, just adding an extra little wrinkle to otherwise ordinary D&D play. In fact, one issue I have with using them in a standard horror convention game is that we often spend a good chunk of time with no insanities, and then once we tip into them it accelerates pretty quickly. 2-3 hours is not very much time to play up the nuances of a level 2 vs. a level 3 insanity from the cards. So next weekend is HelgaCon, and I was already signed up to run a session of Citadel of the Severed Hand, one of my favorite one page dungeons which frankly has some pretty weird and potentially unsettling stuff in it. So I’ve decided to sprinkle in the insanity cards and see what happens. It will still be a classic D&D game with horror elements, not a horror game in a D&D setting, so I’m not expecting the cards to be the focus as they are in my horror games. The cards are just a little light sprinkling of extra flavor. I’m really curious to see how this goes, especially given that I’ve run this particular adventure a couple of times without the cards. I should be able to make a pretty close comparison after the fact. So, look forward to a full report in another week or so on using insanity cards in an otherwise standard D&D dungeon crawl. 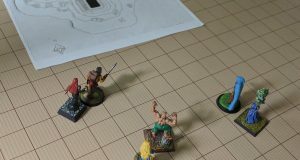 I just wanted to thank you here for your link here to this one page dungeon. I entered this contest for the first time ever this year because of your link! I don’t know if this qualifies as “collaboration” but some kind of synthesis anyway and it feels electric! Awesome Ryan, best of luck to you! I keep wanting to enter myself, but haven’t managed to do so since back in 2010. Perhaps next year.